It’s that chilling time of year again where spooky nail art haunts the nails of witches, ghosts, and ghouls everywhere… are you ready? pumpkins and black cats are awesome, but whenever I have the chance to be different, I go for it! Inspiration struck during the most random of times the other day; while sitting in my law communication class, doodling away as always, I thought it would be cool to try scraping dark color away to reveal a neon color underneath, sort of like that black scratch art paper I played with as a kid. I knew that whatever scratched away the semi-wet polish would have to be flexible and gentle so it didn’t expose my naked nail underneath…and it hit me. Index cards! The paper is thicker than normal, but still quite bendable and easy to work with. I’m happy to report that my idea worked just swimmingly, see for yourself! I’m so happy with this effect! Not only is it great for Halloween, but I can mix up the colors and try this look at any time of the year! I was so excited about this look that I created a super easy tutorial to go along with it! 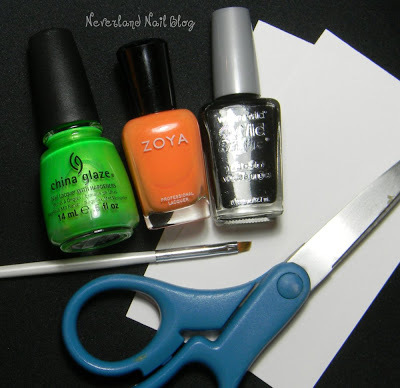 This is an easy, beginner technique using items found around the house…no special nail art tools needed! Polishes of your choice – Pick at least one dark and one bright polish, but you can use more. I chose 3 for my mani and it worked perfectly! 1. 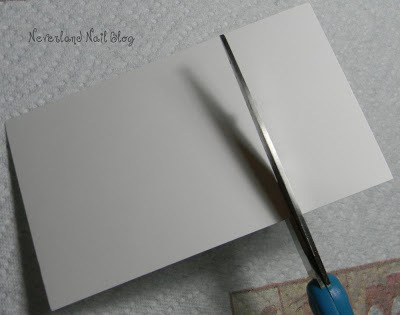 Cut index card into thirds. You’ll want to cut “hamburger style” as shown so there is enough card to work with in the following steps. Don’t worry about cutting super precisely, it won’t matter as long as they are fairly even. 2. 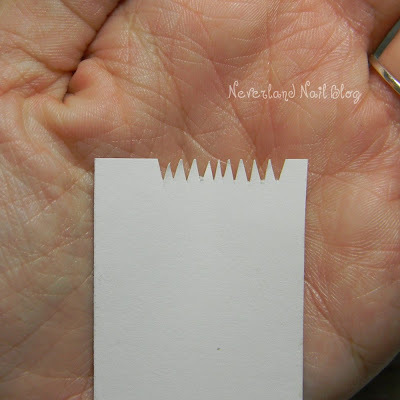 Cut small, narrow, deep triangles into the short, flat edge of the card. Again, you don’t need to worry about these being super uniform. I do suggest, though, that you make them deep and pointy so that the polish doesn’t gather too much on the card or slide off entirely…that isn’t a cute look =P! Here is the finished card. It took me about a minute to make this, but don’t panic! 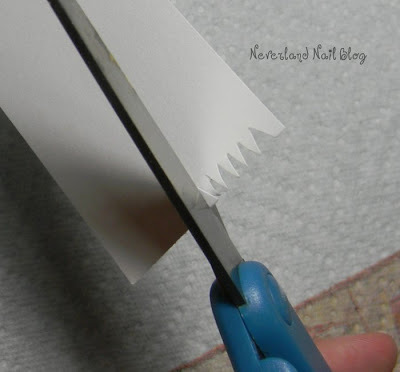 You won’t need to slave away by making one for each nail; I found myself using one card for every 2-3 nails, depending on how goopy the paper became. I’d suggest preparing 5 cards, maybe 6 if you want a backup. Heck, if you want to get them done even quicker, gather 2 or 3 cards at a time and cut the triangles through the whole stack! Once these are ready to go, set them aside. 3. Apply your base coat, let dry. This will prevent staining, allow the polish to go on smoother, and make your whole mani last longer. 4. 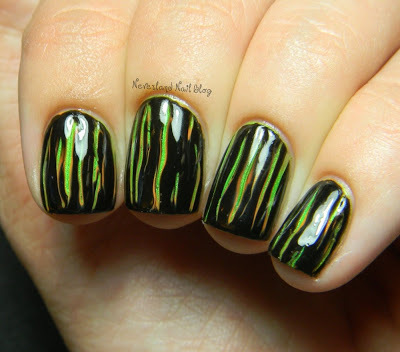 Apply the brightest polish until opaque and allow it to dry completely. I used 2 coats of China Glaze I’m With The Lifeguard, my favorite green at the moment! The next step assumes you are using more than one polish…if you don’t want to do that, skip to step 6. Personally, I liked using 3 polishes because it added more dimension and complexity to the final effect. Also, I would suggest you do each nail one at a time for the next few steps (until it’s time to top coat and clean up). 5. Apply one moderate coat of the next brightest color. Allow to dry slightly. I used Zoya Arizona for this step. You don’t want the polish to be super thin, but not crazy thick either. Find a happy medium =]. I let my nail dry for maybe 30 seconds before moving on to the next step. 6. Apply your darkest color in one moderate coat. 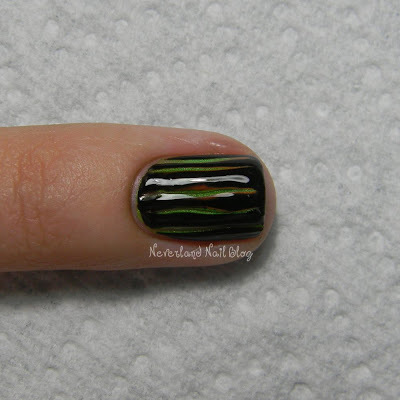 This step would probably work best and look best if the polish is an opaque 1 coater. I used Wet N Wild Black Creme. 7. 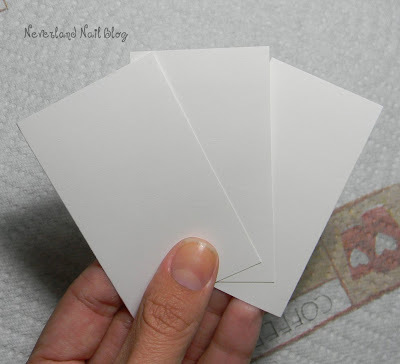 Bend the index card piece to mimic the curve of your nail. 8. 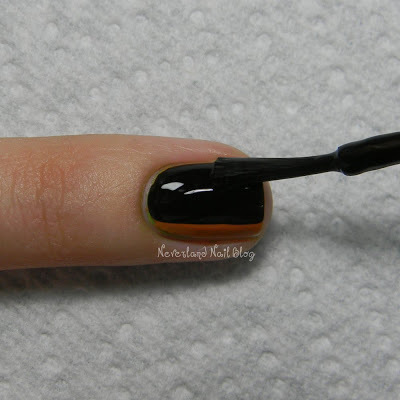 Before the polish dries or becomes too tacky, apply the curved “teeth” at a 45 degree angle near the cuticle with gentle pressure and drag toward the tip.Repeat until desired effect is achieved. Don’t press too hard or you’ll take off the base color, too! Between step 6 and now, only about half a minute should pass. Otherwise, the polish becomes really difficult to work with and may not give the same look. So, in the words of dear ol’ Gandalf the Grey, “Fly, you fools!” (Yup…I’m an LOTR nerd.) Also, you might have a few random polish “peaks” on the tip that form after this step. 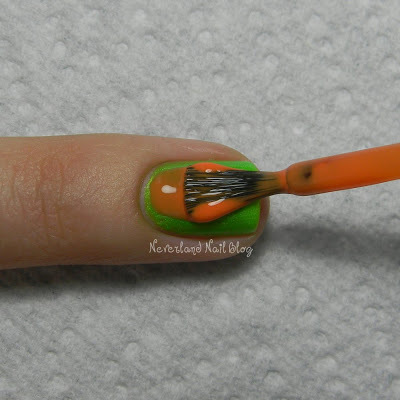 Simply take your clean-up brush or a cotton swap with a little acetone and wipe them off! 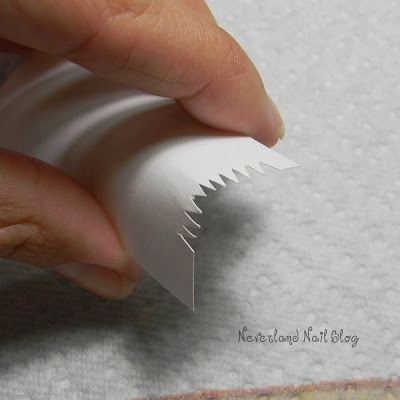 You can also use your finger to gently flatten them back onto your nail. 9. Allow your mani to fully dry. It might take a couple extra minutes due to the thick-ish coats used. I listed this as a step because if you don’t wait for this look to fully dry, the design will smudge and you’ll ruin it. Booo! Nobody wants that! 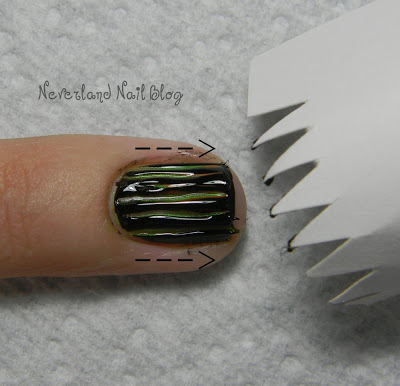 is a fabulous tutorial for nail clean up. 11. Apply top coat to seal in the look! This will protect it, make it last longer, and give it a glass-like shine. There you have it! Now you can proudly wear a scratched look like this for Halloween (or anytime you want!). 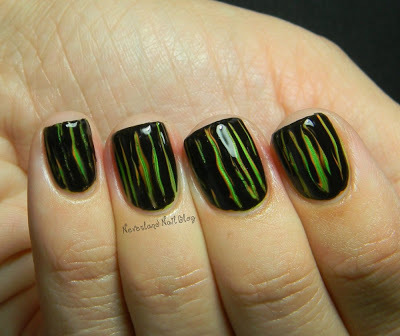 I challenge someone to try this with reds and nudes to imitate actual scratches and scrapes…it would look sort of gross, but perfect for this time of year, no?
. I’d love to see what you all come up with!